Fame - the Musical. Bristol Hippodrome until 24 February 2007. Remember the leg-warmers, remember the dance routines, remember the name � Fame. 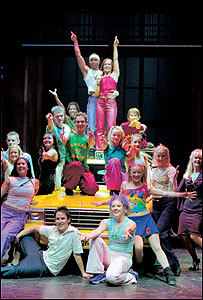 Fame the Musical is enjoying its fifth successful UK tour and is playing for one week only at Bristol's Hippodrome. Set in the New York High School of Performing Arts, Fame follows a group of students over four years of "hard work" in their plight to "make magic' and �live forever". Fans of the 1980 film directed by Alan Parker, or the award-winning Kids From Fame TV series should not expect a repeat of those story lines. The energetic dance routines and the battles for identity in a harsh show-biz world still exist. But Fame the Musical tells its own stories of several characters, exploring themes of prejudice, illiteracy, drug abuse, perseverance, sexuality and love. Some may find the show a little fragmented due to the equal weight given to these storylines. But with such strong characters and with the actors really making the parts their own, it is impossible not to become involved. Abi Finley � from BBC's How Do You Solve a Problem Like Maria? � may have lost out on the lead role in Andrew Lloyd Webber's The Sound of Music, but is now showcasing her talent in the role of love-struck Serena. Finley endears the audience to Serena, bringing warmth and humour to the character coping with the heartache of unrequited love. Carlton Connell brings equal enthusiasm to the role of streetwise Tyrone, struggling to over come his academic difficulties despite his raw artistic talent. Throughout the show Connell has a great rapport with the audience, who were more than willing to follow his invitation by leaving their seats and clapping along. In spite of some touching and moving themes, there is much humour in this production. Mabel the overweight dancer and self-confessed half-bulimic � she has perfected the binge eating part! � is the main source of laughter. Sophia Nomvete, playing Mabel, not only brings perfect comic timing to the role but also wows the audience with her outstanding voice. The entire cast is strong, but other special mentions go to Lucas Rush as Joe Vegas the budding comedian and Madalena Alberto, as the brassy Spanish dancer, Carmen Diaz. It is Alberto who sings the Academy Award-winning song, Fame - the worldwide hit for Irene Cara. Fans eagerly awaiting the performance of this 80's favourite will not be left disappointed. Fame the Musical is a fun and energetic show - from the students' auditions at the beginning, through the rap, ballet and breath-taking contemporary dance numbers to the fantastic finale. Whether a fan of the original film, the TV series or simply new to the stage production, Fame will continue to "live forever" in the hearts of audiences, who aren't quite ready to forget those flying splits or the leg-warmers just yet.